The RunnerDuck Projects page, a place to find all types of projects for nature around the yard. Winter is upon us and some of the little critters out there need some help. 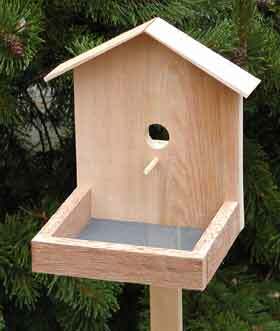 This week we are going to build a squirrel feeder to make the squirrels winter a little easier. I made this project from scrap wood since it's going to just hand outside. 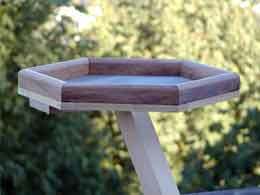 This is a great project to help introduce you child to woodworking. This project started off as a kids project but it soon turned out to be much harder than expected. It still would make a great kids project but with lots of adult help. 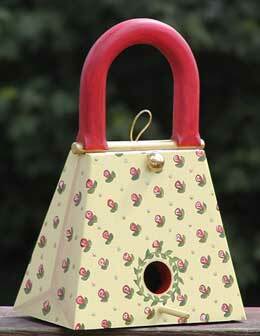 This bird feeder replenishes the food to the birds reducing the frequency that you have to refill it. Marilyn got the idea for this at a you-paint ceramics store that had a ceramic purse/vase. I did the design and all the building and she did all the hard work of making it a piece of art. We think you'll like this little project. Even though there is lots for the birds to eat this time of year it's still a lot of fun to feed them and watch the different species. 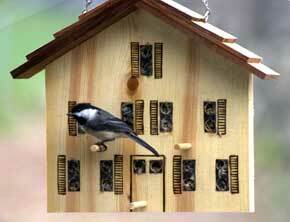 If you put out different types of seed you will get different types of birds. Mix it up and see who comes visiting. We've been seeing these at street fairs and Saturday markets around the area and since we had an old license plate we decided to make our own. 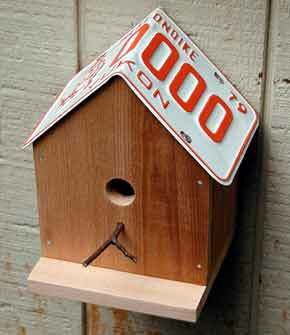 They are simple and a good way to use up an old license plate. We've had this bird feeder for a very long time and it's finally succumbing to the elements. Since we are going to replace it we decided to turn it into a project for you. We like it so much we figured you might like it just as we. The nice thing about it is that it has screen in the bottom so that the rain can run through and the bird seed will dry out really good after the rain. In the spring it's time to start thinking about those little birdies. They are going to be looking for a nice place to set up house and we think this one is pretty neat. 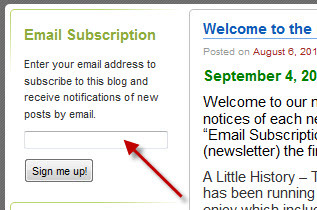 It's a complimentary project to the teacup bird feeder we had in our May 16, 2003 newsletter, www.runnerduck.com/05-16-03.htm. 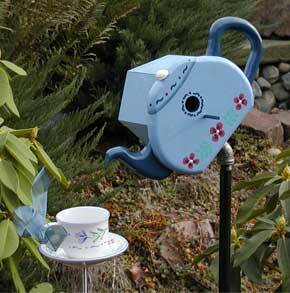 This is a simple little project that would be fun to do with a child or grandchild. It's sort of a cross between a bird feeder and a suit feeder. 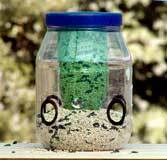 The idea is that you fill the holes with a mix of peanut butter and bird seeds. The birds then pick it out of the holes. It sort of makes them work for their supper.